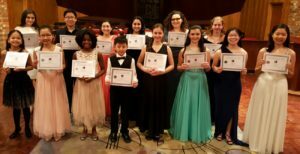 Congratulations to our top sixteen finalists and four honorable mentions of the 2018-2019 MYO Concerto and Vocal Competition! Special thanks to all 74 of our MYO members who submitted applications and shared their exceptional talent with us! Please see our Concerto and Vocal Competition page for more details.